Thought I’d better start living up to the advertising on my Home Page and recommend a Zone 2-8 genus for all my fine visitors from mountain regions, the extreme northern U.S., and those areas in Canada that I’m certain are friendly, picturesque, wonderful places to live, but astonishingly cold in the winter. I get a little giddy about Campanula. It remains to this day one of my all-time favorite perennials in flower. C. glomerata ‘Superba’ is just about everywhere in my gardens, since it blooms rich violet-blue in full sun or part shade, flowers in June before most perennials have showered and shaved, combines well with just about everything, and spreads like a weed. Campanula comes in quite a variety of forms. C. carpatica is well-suited to the rock garden with a mere 6-12 in. height and blue, cup-shaped flowers. C. persicifolia offers spikes of blue flowers and height up to 3 ft. ‘Superba’ grows to 24 in. and stops the traffic on my road when in bloom, due to its clusters of bell-shaped flowers alternating between leaf nodes from top to bottom. A different variety of C. glomerata features white flowers, but white flowers are a dime a dozen; few perennials give you a blue like this. Some books list this plant as hardy Zones 2-8, others Zones 3-8. Truth is it is very hardy (with proper care during the growing season) as far north as Zone 3, with good success in Zone 2 provided you start with healthy, well-bred plants and provide good winter mulch, such as 8 inches to a foot of marsh hay. This plant is going to own the show in June, so stick it where people are going to see it, midway in the flower bed, but avoid the front. The only flaw to the plant is that it brings nothing to the party after it’s done blooming. After the first bloom, deadheading it will extend the color into July, but after that it will have no form or value in the bed. Cut it down to the mound of fresh basal foliage and let it build up more roots for next year. Plant a wave of at least three plants behind some later-blooming plants, so they hide the mounds the rest of the season. You can also plant a mid-sized annual, such as salvia or the taller snapdragons, in front of the mounds to hide them from view. Does best in full sun but mine look great with only four hours of direct sunlight. 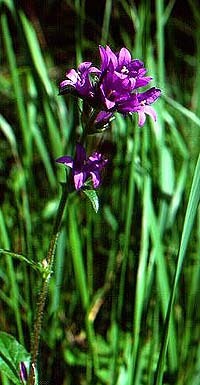 Campanula can take heat and dry periods but rots out in overly moist soil. After blooming, I treat it like an iris, and water it sparingly through fall. NEVER CUT THE PLANT DOWN IN THE FALL. Next spring you will be rewarded with a good number of new plants as far away as 8 in. from the mother plant. Divide in early spring or mid-fall.